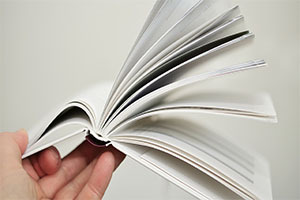 One hundred words WELL learnt will always trump one thousand words badly learnt and hastily memorized. 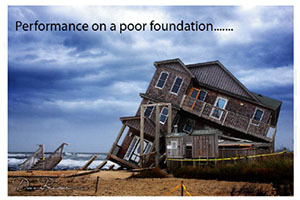 I’d rather have a modest single storey house built on a very strong foundation than a mansion built on a shaky one. To me, a hundred of the most commonly used words well learnt reinforced with some basic grammar, is a strong and stable foundation to build on. I would not want to consider building anything until I have such a foundation in place. What made me start using The Approach? Being a native speaker does not automatically make you an expert in your first language in an academic sense. I think that at some level, we are all fully aware of this. I’m confident that at least once in our adult life, we would have entertained the thought that if we are given a chance to do it all again, then we would do things differently (read better) in our life. In terms of the learning of our native language, this would translate to taking a more holistic approach and with more emphasis on the academic side of things, more looking up things, more reading, more grammar, etc. So I looked at this as a sort of learning tip, if you like. All the things that I never did when I was learning English (but wish I did), I’ll now do with learning Thai. In a nutshell, that is how The Approach came to be. 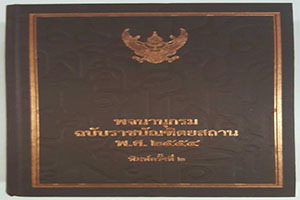 I use the Royal Society Dictionary (ราชบัณฑิตยสภา) or in short, the RSD (formerly known as the Royal Institute Dictionary or in short, the RID) as my main TTD. To me, the RSD is the starting point of The Approach. 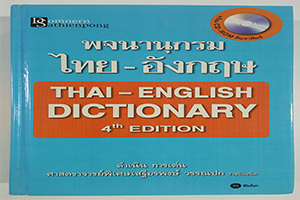 Basically, the RSD is to Thailand, what the Oxford English Dictionary (“OED”) is to the United Kingdom. The RSD does have its limitations, well, nothing in the world is perfect, right? 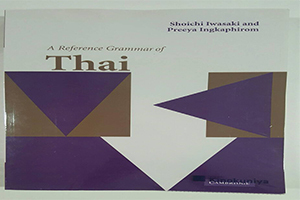 This does not however take anything away from the fact that it is the most authoritative and comprehensive Thai – Thai dictionary out there right now. So whilst I’ll be the first to agree that we should not treat the RSD as the begin-all AND end-all, I still think that there’s tremendous value in using the RSD as the begin-all, as the starting point so to speak. I think that we all know the basic principle of dictionary use and that is to always use a current one. No doubt we are also familiar with the old adage ‘better late than never’. 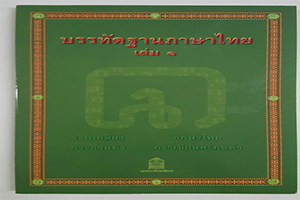 Having said that please note that the RSD has issued their ‘dictionary of new words’ (volumes 1 – 3) (พจนานุกรมคำใหม่ ฉบับราชบัณฑิตยสถาน เล่ม ๑-๒). 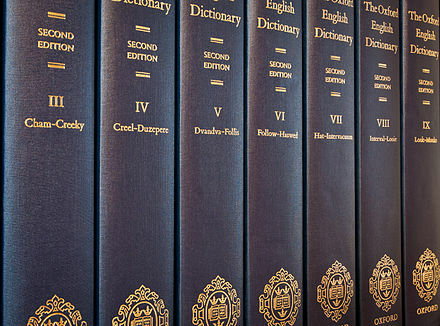 In this blog, all references to the RSD shall be deemed to be a reference to the RID 2011 edition as well as to all three volumes of the RID dictionary of new words. You may purchase the RID 2011 edition as well as all three volumes of the RID dictionary of new words at any one of the major book chains in Thailand. Here’s the link to Wiktionary’s RID dictionary of new words. In terms of dictionary definitions, I think that dictionaries number only the different ‘core’ meanings. The RSD also does this. There may be different ‘shades’ of meaning within each ‘core’ meaning however it is not usual for dictionaries (including the RSD) to number the different shades of meanings. I number the different ‘core’ meanings of a word according to the RSD’s numbering however I go one step further. I also (arbitrarily) number the different ‘shades of meanings’ within each core meaning not only for convenience but also for use as a learning tool. Let’s take for example, the word เอา. 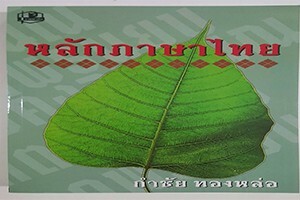 Many foreign students are taught that เอา equals to ‘(to) want’. Full stop. That’s all there is to it and that’s all you need to know. The worst part is, even though some of the students are extremely good in their native languages (and no stranger at all to using dictionaries), they buy into this approach without questioning it at all. Is it because the mindset is that Thai is soooooooo exotic and so it must be completely different from all other languages in the world? Or worst, Thai is soooooooo limited that most words have only one meaning? Not the correct mindset to begin with, wouldn’t you say? Now, let’s try out The Approach, shall we? 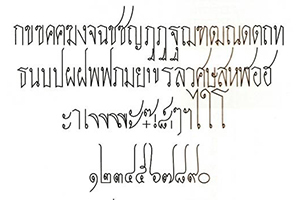 Looking at the RSD’s entry for เอา and using the approach and the terminology I’ve mentioned above, you’ll see that there are two core meanings and that there are seven shades of meanings within the first core meaning. 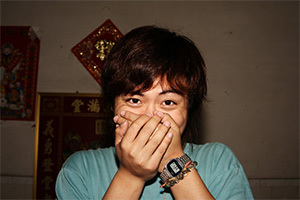 ก. ยึด เช่น เอาไว้อยู่; รับไว้ เช่น เขาให้ก็เอา; พา, นํา, เช่น เอาตัวมา; ต้องการ เช่น ทําเอาชื่อ ทำงานเอาหน้า; ถือเป็นสําคัญ เช่น เจรจาเอา ถ้อยคํา เอาพี่เอาน้อง; (ปาก) คําใช้แทนกริยาอื่น ๆ บางคําได้. ว. เมื่อ ใช้ลงท้ายกริยา เป็นการเน้นกริยาแสดงถึงการตั้งหน้าตั้งตาทําต่อเนื่อง กัน เช่น กินเอา ๆ. (โบ) น. เรียกลูกหญิงคนที่ ๙ ว่า ลูกเอา, คู่กับ ลูกชายคนที่ ๙ ว่า ลูกเจา. (กฎ.). As you can see, if you were to follow an approach like this, you would know early on that เอา meaning ‘(to) want’ is the fourth shade of meaning of the FIRST CORE MEANING of เอา according to the RSD. If a student knows this, then even if the student has not yet learnt the other meanings of เอา, at the very least the student would be aware that there ARE other meanings. You may not have learnt and/or come across the other meanings yet but you should at least read through them. Then as and when you do learn and/or come across them, you will have a rough idea of where they fit in. One of the main limitations of the RSD is the fact that it does not give as many specimen sentences as we would like. So we need to supplement the RSD definitions with as many specimen sentences as we can find. 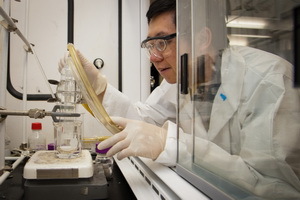 You should ensure that you only collect specimen sentences that are 100% TT. They may come from TT books or other TT materials that you have read or are reading or mined from Google (from TT sources, of course). Whenever possible, it’s a good idea to note down the source of the sentence as well as the context in which the sentence is used. Make short ‘context notes’ if you like, beside the sentence. In IMPORTANT POINT NUMBER ONE, I’ve said that Thais are kings of context. 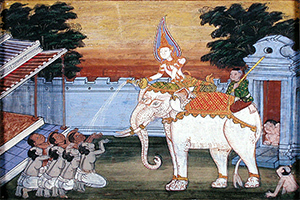 In Thai, context is king and Thais are kings in catching meaning from context. If you are not yet at that level, you will need a lot of practice before you can reach that level. Whenever in doubt, ask trusted Thais to clarify the context and the meaning intended for a particular context instead of just assuming (or wrongly presuming) things yourself. Then ask whether or not that particular meaning may be used in other contexts. 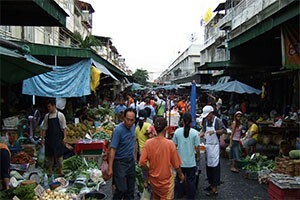 If you’re speaking to a Thai and he uses a sentence with a word or phrase that you are interested in learning, then you should ask him not only to clarify the meaning of the word or phrase as he intended but also clarify the context. I’ll be saying this many times: not every Thai reads the RSD religiously so you should indirectly ‘assist’ the exchange by playing what I call the ‘eliminate the suspects’ game. Let’s say that he used เอา in a sentence and you think that he meant the fourth shade of meaning, that is ‘(to) want’. If you wish to clarify this, you should just ask him this directly. Then for good measure, you may throw in “You didn’t intend to convey the fifth shade of meaning of ‘(to) treat as being important’, right?” Something like that. Then you ask him to clarify the context. Maybe something along the lines of “Do you only use เอา for situations like this, I mean [then you outline the situation]?” so as to make it easier for him to respond. I hope that it’s clear that the learner must take the initiative and do all the heavy lifting. With the right mindset, adequate preparation, and asking all the right questions, you’ll be able to take your Thai language learning to new heady heights. Just being a native English speaker does not automatically make you an expert in English, at least not from an academic standpoint. 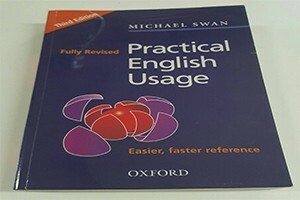 You are fluent, no doubt, you have a lot of experience in using it, sure, but do you know it well enough to be able to adequately answer technical questions about it, the way say Michael Swan does in Practical English Usage? Some people may know the answer but maybe they’ve forgotten it or some can still remember the answer but are unable to explain it in a clear and concise way. At the very least, what’s the harm in ‘reviewing’ something you already know? 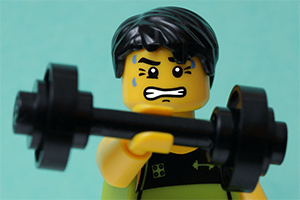 You’ll never know it, but there may be something interesting that you’ll be able to take away from this exercise. As I’ve said in IMPORTANT POINT NUMBER ONE, you should use your first language as the navigator and not as a backseat driver. When you’re learning a Thai word or phrase, instead of trying very hard NOT to translate it into your first language (an exercise in futility, really), use your first language to come up with a number of close equivalents instead. I think that we should not be mentally lazy and go with a “There’s always just ONE ‘one size-fits-all’ exact first language translation.” Granted, occasionally there may very well be an exact translation, which is not surprising because all users of language are humans living in the same planet, but more often than not such an approach will only limit your Thai language learning. Once you’ve got a list of ‘suspects’ (potential close equivalents), you should ‘refresh’ your memory by looking them up in your favorite EED. To refresh your memory about the subtleties and nuances in respect of usage of words with seemingly similar meanings, you may want to look through books like Practical English Usage or Google search articles with the relevant discussions. Then, we would be in a better position to narrow down the list of suspects even further and get pretty close to a potential closest equivalent (sometimes a few). 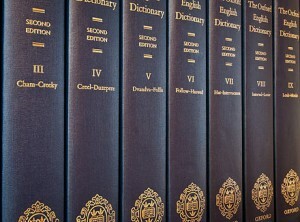 My favorite EED is the Oxford Advanced Learner’s Dictionary. We would now look at how a TED defines the word in English (for convenience I’m operating on the assumption that your first language is English but the same principles apply to any other native language). I use Thai-English Dictionary by Domnern Sathienpong. We would then go back to our shortlist of close English equivalents and look them up in an ETD. The definitions in different dictionaries may vary quite a lot so I make it a point to look through at least two ETDs. 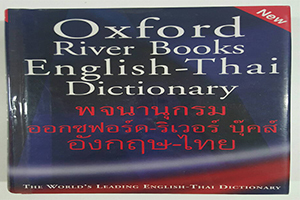 I usually start with Oxford River Books English-Thai Dictionary. And I’ll usually end with A New English-Thai Dictionary by Tianchai Lamworamate. If you’ve reached this point, I dare say that you will start to have a pretty good idea of what would be a close English equivalent(s) for the Thai word you are learning however even though it feels like we have gone farther and further than others (in my experience many learners just use ONE dictionary, if at all), we’re not done yet. the context(s) in which the word or phrase is commonly used. Usually such Google searches will throw up quite a number of different sentences using the word or phrase that you are looking up. You would want to collect such sentences (provided they are TT of course). I call sentences like this ‘Sentences Mined from Google’ and I try to include as many of these (the relevant ones) as I can in each of my blog posts. 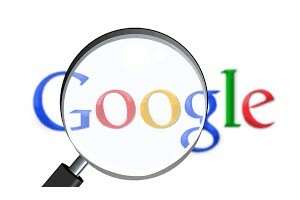 If a picture is worth a thousand words, then a Google image search result is worth a hundred thousand words. We should then do Google image searches, first based on the Thai word or phrase and then on the shortlisted English equivalents. The relevant images that you find should be saved / copied and pasted on your notes and/or flashcards. For users of flashcards, I think that instead of just having English words on one side (with the RSD’s definition on the other side), you may want to try having just pictures on one side (with the RSD’s definition on the other side). 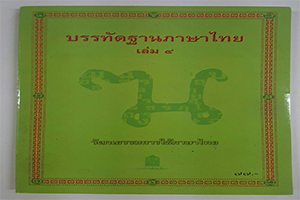 You may even want to try making and using all-Thai flashcards, with the Thai word or phrase on one side (with the RSD’s definition and/or relevant picture on the other side). 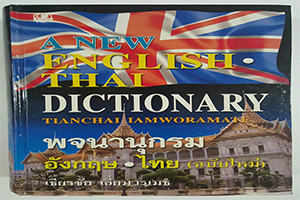 English equivalents are useful to aid understanding and when you need to translate however as far as possible, the emphasis should always be on trying to define Thai words in Thai, in short going ‘all-Thai’. As you start getting used to reading Thai definitions of Thai words and working on all-Thai vocabulary notes and/or flashcards, if and when you need to ask a Thai the meaning of a word, you should request the Thai NOT to give you an English equivalent (no matter how good his/her English may be) but a definition entirely in Thai instead. You can explain that you are trying to avoid using English equivalents so as to start getting used to using only definitions in Thai to understand Thai words or phrases (you will also try to define Thai words or phrases in Thai). Think of English equivalents as a passport. It’s useful to have, but you only use it as and when you need to use it. When you reach this point, it is highly likely that your brain will have started to cross refer the word or phrase that you are looking up with other words or phrases that appear to be related in some way. In short, possible ‘matchups’ may begin to form in your mind. This is the time for us to check our notes to see whether or not we have any materials in respect of such ‘matchups’. If there aren’t any, then we should refer to authoritative texts to get adequate materials to enable us to resolve the ‘matchups’. 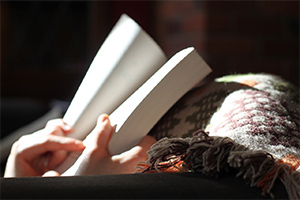 There are reference books of different levels so use the one that you are most comfortable with. I normally use the following. Google searching keywords based on the said issues may sometimes bring up interesting and relevant academic articles written by Thai academicians or scholars. They are worth collecting because you never know when you’ll need to refer to them. I think that the matchups blog posts (under ‘Thai Language’) that I write in this blog is a good illustration of what I’m talking about here. I always aim to practice what I preach. 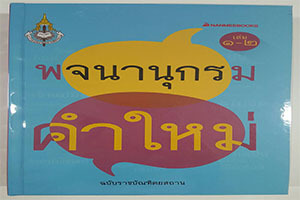 When you wish to discuss any issues or points regarding the meaning and/or usage of Thai words or phrases, you should definitely make it a point to seek out Thais to get their definitions and usage examples. You should not however limit your discussion partners to Thais only. 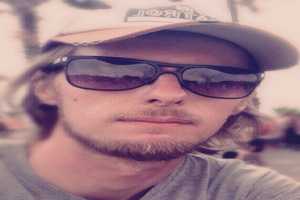 You may want to discuss the issues or points with foreigners too (those who speak your native language and is objectively considered by Thais to be fluent). Sometimes the different approaches and way of thinking can really help to clarify the issues for you. Native speakers acquire their native languages ‘organically’ (think ‘inherit’ in a very broad sense) whereas foreign learners have to actually work at acquiring a second or foreign language. If you are able to tap into both of these ‘viewpoints’, you will see a much bigger picture. The point that I have made above about ‘native speakers not automatically being experts in their first language in an academic sense’ applies to everyone including Thais. 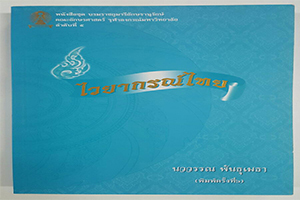 So when you ask Thais for the meaning of Thai words or phrases and the relevant specimen sentences, you should ask as many Thais as you can and if possible the Thais who you approach should be drawn from different cross sections of Thai society. 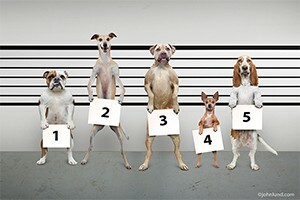 Again, you may be pleasantly surprised by the different results that you get. This is what is known as the ‘ask 10 Thais test’ (first coined by Luke Bruder Bauer and rather self-explanatory I think). I will be saying this quite often: do not assume that every Thai reads the RSD religiously. 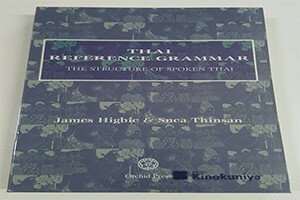 If you know the RSD definition of the Thai word or phrase that you wish to seek clarification on (I’ve alluded to the fact that the RSD is not perfect), you should just share the RSD definition with the Thai that you’re consulting. You may say something along the lines of “I’m sure that you’re already familiar with this definition of the RSD, right?” Having given him / her time to read the definition, you may then ask him / her to elaborate on the definition or perhaps explain it in his / her own words. You may then lament the fact that there are hardly any specimen sentences given by the RSD to illustrate the usage of the words defined therein and for him / her to help ‘supplement’ the RSD in a sense, by giving you SOME specimen sentences. To aid this process, you may want to run some of the Sentences Mined from Google that you have collected before this (please look at the discussion above) by them for them to confirm and/or comment on. If you carry out the ‘ask 10 Thais test’ this way, there is no doubt that you will get many relevant specimen sentences to add to your collection. Finally, we come to the never ending process of ‘testing’ the meanings and/or close equivalents that you have procured using The Approach. 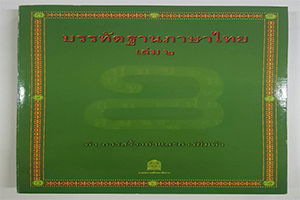 As you continue to use and be exposed to the usage of Thai, you will be able to ‘prove’ or ‘disprove’ the propositions that you have made in your notes. Many will attest to the fact that there’s a point where you will acquire the ability to ‘self-correct’. I believe that The Approach will enhance this ability tremendously. If you have not yet acquired this ability, the Approach can greatly accelerate the process. 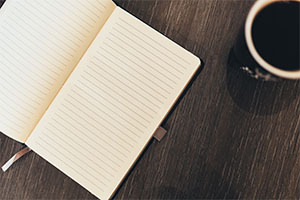 On the basis that you have the ability to ‘self-correct’, you should from time to time re-write and revise your notes to update them and to take into account the results of all the ‘proving’ that has taken place. I normally look at how many ‘versions’ of notes a learner has, when I’m judging how dynamic his learning process is. Windows is now (at the time of writing) at Windows 10, you get the point. 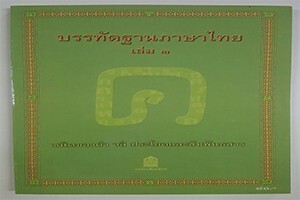 If you feel that, at any stage of The Approach, the meaning of the Thai word or phrase somehow does not ‘fit in’ with the traditional and/or accepted definition(s) or something does not feel right about the usage (but you can’t put your finger on it), then it is highly likely that there may be an issue relating to Thai culture involved. And that, my fellow Thai journeymen, is what The Approach is. Please feel free to Contact us with any comments / feedback and/or questions that you might have and we’ll get back to you as soon as we can. If you’ve found The Approach useful, we’d be very grateful if you’d help it spread by e-mailing it to a friend, or sharing it on Twitter or Facebook. Thank you!